Kam is prepared to do anything to protect Elvenrude, but can she protect her own heart? Kam has all the traits of a likable heroine. She is smart, strong, caring, and loyal. Her devotion to Elvenrude is absolute and she’s willing to break a few rules in order to protect her home and the people she loves. However, I found it interesting that she is not willing to take the same risks in regard to her heart. Even though her attraction to Seth is clear to everyone around them, Kam stubbornly refuses to acknowledge her own feelings. I did appreciate Seth and Kam’s antagonistic banter, but at a certain point, I just wanted her to be honest about her feelings. Whether Kam wants to admit it or not, Seth is a good match for her. He’s every bit as smart and strong as she is, and he’s willing to let her have the freedom she craves regarding her career. I must give Seth credit for his patience with Kam. He never pressures her, but he wasn’t shy about letting her know how he felt. I found his direct manner refreshing, and it was easy to hope that he and Kam would find a way to be together. Elvenrude sounds like a beautiful place secluded from the noise and pollution of the human world. I could clearly picture the tree houses and the natural beauty of the land. I found the elves obsession with human gadgets amusing. Things like coffee, bikes, and electronics are commonplace in the human world, but are novelties for the elves. It was interesting to watch the elves try to maintain a balance between their world and the human world and see what they deemed acceptable and what they thought had the potential to corrupt. I do think the ending was a little odd. After so much build up concerning who was behind the portal disturbances, I think the reveal of the mastermind was rushed and a bit anticlimactic. I also wanted more explanation concerning this character’s motivations. Despite this issue, I still found it satisfying to see the villain brought to justice. Overall, I think Cross Keys is a good book. Kam and Seth make a good team, and I enjoyed watching them work together to solve the mystery. 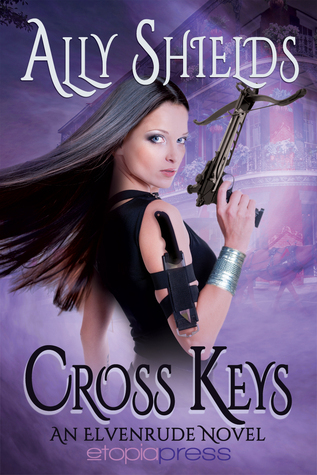 I recommend Cross Keys to anyone who likes fantasy with a modern twist.